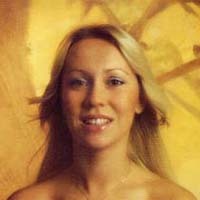 Agnetha Faltskog was born in Jonkoping, a town in the middle of Sweden on April 5 1950. Her father ran local amateur revues so Agnetha learned to get up on a stage early in life. At the same time she began to write songs which she sang in revues herself. The earliest was from 1958 and is about two small "trolls." In 1965 she began to sing with a dance orchestra and continued with this for about two years. She sent a tape into a record company, CBS-Cupol, in the autumn of 1967 with the result that her first record was released at the beginning of 1968. It was one of her own compositions I WAS SO IN LOVE and it was a real breakthrough for Anna. I WAS SO IN LOVE was at the top of the best selling lists within a couple of weeks. After that she took part in many TV-programs and went on tour in the Swedish "folk parks." She had offers from Germany too, and at one time she was spending as much time there as in Sweden. In 1971 she was given the chance to play Mary Magdalene in the Swedish version of JESUS CHRIST SUPERSTAR. The critics thought she showed acting ability as well as musical talent. In 1968 Anna met Bjorn Ulvaeus and they married a few years later. Then in 1971 they began to work with Benny Andersson and Frida Lyngstad in ABBA. Favourite group: Beach Boys, Eagles, etc. Shes blond, ethereal looking-but also temperamental and decidedly self-assured. She was Mary Magdalene in the 1971 Swedish production of Jesus Christ Superstar. And a household name in Scandinavia long before anyone ever thought of the unlikely group name ABBA. Agnetha, writes her own songs too. But then, Agnetha has been composing songs since she was 8. The world wide success of ABBA has somewhat changed life for Agnetha the composer, though.There is just not enough time to keep two careers going simultaneously. There is also daughter Linda, born in 1973, demanding lots of attention. Plus the inevitable travelling, so much more hectic than when she married Björn in 1971, at a time when ABBA wasnt even a dream in their managers mind. That goes both for studio chores and private, day to day life. Also, nobody would call Björn and Agnetha "big spenders". They own a lovely house in Lidingo, a Stockholm suburb (to which Benny and Frida soon will move, not coincidentally...). The two couples share a gorgeous summer island in the Stockholm archipelago. But Frida and Benny also love to take extended holiday trips to exotic shores, while Björn and Agnetha spend off time around home base, with little Linda. (According to the others, Agnetha is often busy running up Scandinavias most formidable telephone bill, always reporting to mrs. Fältskog on her granddaughters progress...). "Choreography" and "clothes" are possibly the two most asked-about subjects for the girls to cover on press gatherings. As for clothes, the group gets some ideas of their own, while the rest of their often fanciful outfits are designed by "two marvellous guys with this little boutique in Stockholm". Ambitious, selfassured, multitalented-thats Agnetha, if you want to paint a larger-than-Iife picture of cardinal virtues. And IF you do-you can bet your last "krona" that Agnetha Fältskog will beam her most deprecatingly wry smile your way and say its just been lots of sheer luck. Then, dont belive her. Ever since one of the "biggie" record companys got hold of her first test tapes, back in 1967, she has known her directions. – Thats why I approach this tour with some trepidation, you know. Will we be able to live up to our loyal fans expectations? God knows weve been working hard in front, trying to cover all the little details that go into a good road show. Its going to be an exciting test-a First for us, since we never done a l-i-v-e tour this big before. Both Agnetha and Frida may feel that those subjects not necessarily have to be "girl talk; but just for the record: yes, Agnetha and Frida do spend a lot of time on their stage choreography. She can be deceptively ethereal looking – but don’t let it fool you. She’s also temperamental, self-assured, and the mature mother of two: Agnetha Fältskog. She may be the youngest ABBA member. But she was Mary Magdalene in the 1971 Swedish production of “Jesus Christ Superstar”. And a household name for Scandinavian record buyers long before ABBA was formed. Agnetha even wrote her own songs, and very strong ones they were. At one time, a hit album of hers was strong competition for the “Fernando” single by ABBA; since then, Agnetha has cut down on her own song writing in order to concentrate more on her singing. Also, Agnetha wrote most of her tunes with only Scandinavian audiences in mind; her native language is, for obvious reasons, not especially suited for the international market. But the fact remains – Agnetha was composing perfectly sensible songs already at eight years of age. Her father used to stage local amateur reviews in the town of Jonkoping, mid-Sweden, half way between Stockholm and Gothenburg. According to Agnetha’s proud parents, the first tune dealt with two fairy tale “trolls”. The ABBA story may also read somewhat like a fairy tale. But Agnetha will probably never be caught paying lip-service to so called virtues like “humility”, “bashfulness” etc. To Agnetha the ABBA story started soon after she and Bjorn were married in -71. And it will continue indefinitely, even though the couple divorced last Fall. Agnetha has been singing more or less professionally since she was 15, then starting gaining stage experience with home town dance bands. Rumours of Agnetha’s talents soon spread to Germany, where she spent lots of time in television studios by the end of the 60’s. By then she had already met Bjorn, singing back up vocals and fulfilling night club engagements with him. Now, those days seem very far away, she admits. Since then, things have happened with lightening speed. – 8 or 9 years ago, almost everything was fun-and-games. Obviously, there are heavier demands on us now. – Also, when you get to be older, you tend to be more critical of yourself. There’s so much musical talent around. Of course, there is an element of luck – singing the right song at the right time, things like that. Agnetha works with her voice, constantly. Singing lessons twice a week, but also keeping her body in good shape jogging around pastures close by hers and her two kids suburban home, outside Stockholm. A habit she picked up while married to Bjorn. Success of the ABBA magnitude often breeds jealousy. In her native Sweden, Agnetha responds to an occasional critical remarks concerning ABBA's spectacular track record with very little bitterness. – We do not “speculate” with our music by trying to write and perform songs that will reach as many as possible, she says. – You just can’t do things that way, it’s not even possible – and that’s that! One aspect of the music industry that really turns her off – and, consequently, turns her temperament on – is all the seemingly unnecessary preoccupation with non-musical details. Such as “looks”, “clothes”, “money”, “taxes”, “favourite this-and-that”. Both Agnetha and Frida may feel that most of these subjects should be “off-limits”. But just for the record: yes, they do spend quite a lot of time and money on the groups stage image. And well – who’s surprised? – The US part of our tour this Fall will be an exciting First for us. It’ll also be the longest tour we’ve ever done. We just hope we can live up to all expectations!